The Special Photograph of the Missionary Image of Our Lady of Guadalupe was taken in the Chapel of the National Sanctuary of Our Sorrowful Mother in Portland, Oregon on August 15, 1991. It seems most appropriate that her image was placed under the large picture on the front wall of the Chapel which depicts the Holy Trinity bestowing the crown of Queen and the dignity and power of Queen on her so that she ma crush the head of Satan (cf. : Genesis 3:15) and open a new world. 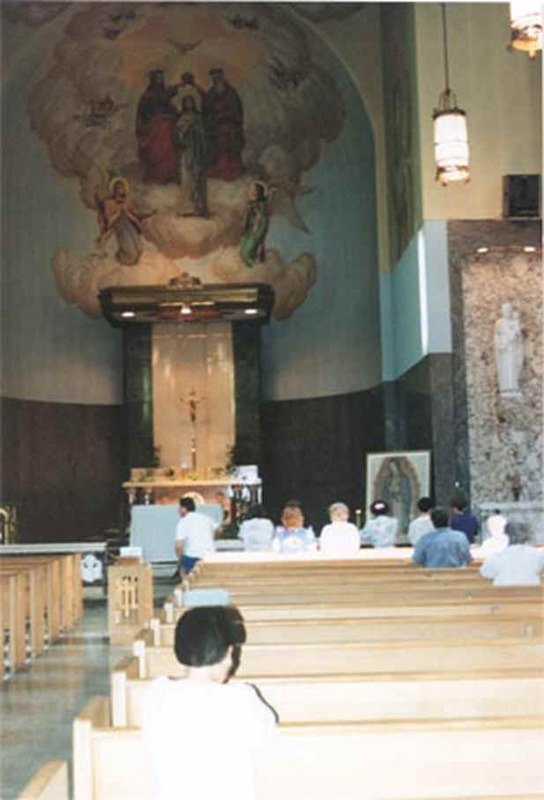 On August 15, 1991, the feast of Our Lady’s Assumption, some of the faithful remained in the chapel after the Mass to pray before the Missionary Image of Our Lady of Guadalupe. The Special Photograph of Our Lady was taken a few minutes later without any expectation that new images would be revealed in the original Image of Our Lady of Guadalupe. OUR LADY CONVERTED MILLIONS OF THE AZTEC INDIANS TO THE CATHOLIC FAITH BY CONVINCING THEM, WITH THE MIRACULOUS IMAGE OF HERSELF ON THE TILMA OF JUAN DIEGO, THAT SHE IS THE MOTHER OF THE TRUE GOD AND THEIR MOTHER AS WELL. SHE SUCCEEDED IN PUTTING AN END TO THE WORSHIPPING OF FAULSE GODS AND ALSO SACRIFICING HUMAN LIVES TO APPEASE THE FALSE GODS. THE CATHOLIC FAITH HAS TAKEN ROOT DEEPLY IN THE HEARTS OF THE COUNTLESS POPULACE OF LATIN AMERICA. OUR LADY ALSO SAVED THE ENTIRE CATHOLIC EUROPE FROM THE POWERFUL INVASION OF THE FORCES OF OTTOMAN TURKEY ESPECIALLY DURING THE BATTLE OF LEPANTO ON 10/7/1571 (cf. : “Our Lady of Guadalupe at the decisive moment in the battle of Lepanto by Dr. Charles Wahlig , A Handbook on Guadalupe, Franciscan Friars of the Immaculate). 1. WORSHIPPING FALSE GODS SUCH AS ERRONEOUS IDEAS, MONEY, SELFISHNESS, PRIDE, AND MORE. 2. REFUSING TO RECOGNIZE AND FEAR THE INFINITE HOLINESS, TRUTH, GOODNESS, JUSTICE, AND POWER OF GOD. THUS, NEGLECTING HIS TEACHINGS, TRADITIONS, MORAL RULES AND HIS CHURCH. 5. DENYING THE DIVINITY OF OUR LORD JESUS WHILE ADMITTING HIS HUMANITY AND THUS ALSO REFUSING THE TRUTH OF OUR LADY BEING “MOTHER OF GOD”. 1. THE IMAGE OF THE HOLY EUCHARIST: OUR LADY GAVE BIRTH TO JESUS IN THE FORM OF THE HOLY EUCHARIST AND WORSHIPS AND PRAYS TO HIM. WE MUST RESTORE THE TRADITIONAL FERVENT DEVOTION TO THE HOLY EUCHARIST. 3. THE IMAGE OF OUR LADY KNEELING, WEEPING, AND PRAYING FOR UNBORN BABIES: END ALL ABORTIONS AND RESTORE HOLINESS, PRAYERS AND LOVE IN FAMILY. 4. THE IMAGE OF OUR LADY’S IMMACULATE HEART: CONSTANTLY LEARN FROM, MEDITATE ON, AND BE UNITED WITH OUR LADY’S IMMACULATE HEART. THIS WAY, WE CAN BE CLOSER AND MORE FAITHFUL TO JESUS AND MORE HUMBLE AND FILLED WITH GRACE. 5. THE IMAGE OF THE BRIGHT AND POWERFUL LIGHT OF GOD RADIATING FROM OUR LADY: LIVE IN THE SUPERNATURAL LIGHT OF GOD. THIS WILL CHASE AWAY ALL DEVILS AND EVIL THOUGHTS AS WELL AS SPIRITUAL LAZINESS. 6. THE IMAGE OF OUR LADY’S HAIR: TO RECEIVE AND WEAR THE ROYAL CROWN, OUR LADY REMOVED HER VEIL. HAVE TOTAL TRUST IN HER POWER AND MOTHERLY LOVE OF OUR LADY, THE VICTORIOUS QUEEN OF THE WORLD.